BUR OAKS DISPLAY HOME NOW AVAILABLE FOR PURCHASE!!! 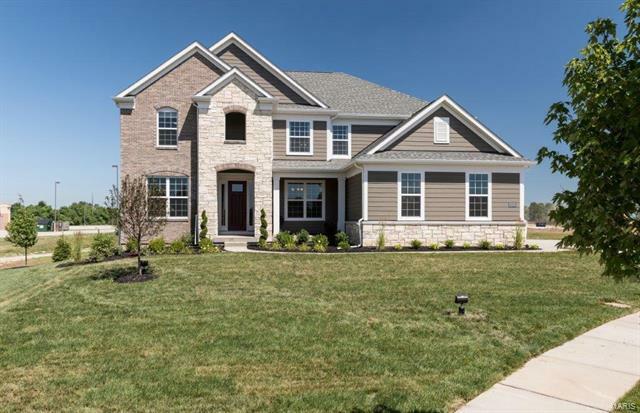 This fabulous 3,668 sq ft model home is full of added extra options and is located in the highly desired Rockwood School district. As you enter the home you’ll immediately notice the beautiful wood floors and private den. You’ll love the Great Room with its two-story high ceiling, stacked stone fireplace, large windows and spindled stair case. The kitchen has a large center island, upgraded cabinets, Quartz countertops, built-in appliances and an attached sunroom off the café. The Master Suite has an attached Owners Retreat area, tiled walk-in shower, large walk-in closet and separate Quartz sinks. Other extra features include 9 ft basement foundation, 4 car garage, cabinets and countertop in the oversized laundry room, stainless steel refrigerator with washer and dryer. Enjoy the Tot Park with swings that Bur Oaks offers along with the walking trail and lookout points with natural stone seating that overlooks Chesterfield Valley.